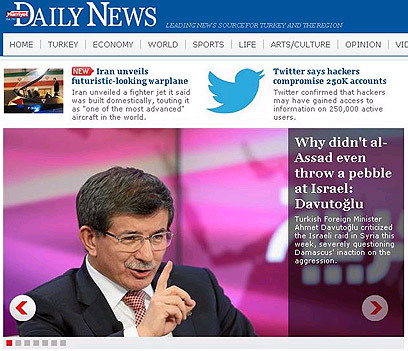 Turkish Foreign Minister Ahmet Davutoglu slammed Israel's alleged strike in Syria, urging Damascus to retaliate, the Hurriyet news agency reported. "Why didn't (Bashar) Assad even throw a pebble when Israeli jets were flying over his palace and playing with the dignity of his country?" Davutoglu told reporters Saturday on his way to an international conference on Syria in Munich, which Defense Minister Ehud Barak is also expected to attend. "Why didn't the Syrian Army, which has been attacking its own innocent people for 22 months now from the air with jets and by land with tanks and artillery fire, respond to Israel's operation? Why can't Assad, who gave order to fire SCUD missiles at Aleppo, do anything against Israel?" Davutoglu added. The foreign minister suggested there might exist a collaborative conspiracy between Israel and Assad's regime. "Is there a secret agreement between Assad and Israel? The Assad regime only abuses. Why don't you use the same power that you use against defenseless women against Israel, which you have seen as an enemy since its foundation," he said. The Turkish Minister insisted that Turkey will not stand by as Israel attacks a Muslim country. including a biological weapons research center that was reportedly flattened out of concern that it might fall into the hands of Islamist extremists fighting to topple the government of the Syrian president. A variety of news organizations reported that Israeli jets hit a convoy carrying advanced anti-aircraft defense systems toward Lebanon’s Beqaa Valley, presumably for delivery to Hezbollah. See all talkbacks "Turkey slams Syria's inaction over 'Israeli strike'"